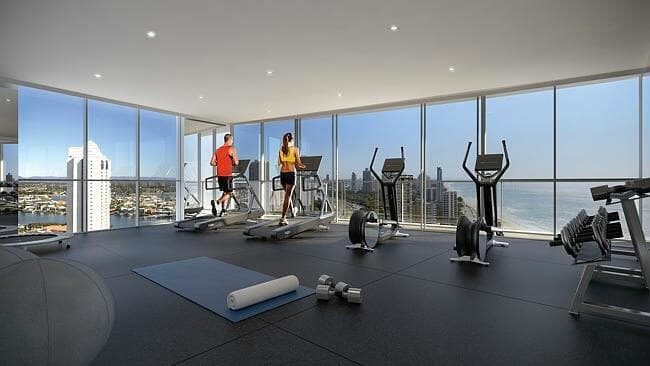 PRICES, images and yes, even a name have been revealed for developer Ho Bee Land’s $120 million Surfers Paradise high-rise apartment. In a poetic twist, the soon-to-be-built tower will be called Rhapsody Surfers North, offering 223 apartments with prices ranging from $280,000 for a studio, to $867,000 for high-level, two-bedroom units with north-easterly aspects. Project Marketing agent Deborah Provost, of DP Project Marketing, said the project would offer a diversity of product at prices that had not been seen on the beach strip for at least a decade. 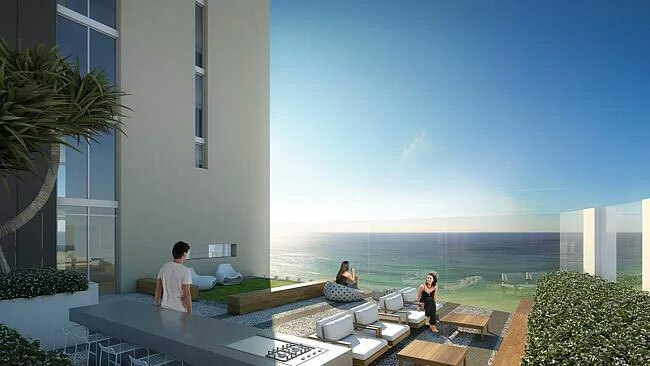 She said It also offered a top lifestyle for its residents thanks to the views, rooftop garden, cafes, nearby beach and the Surfers North light rail station which will be located opposite the tower. Most of the two-bedroom apartments on the middle floors will be priced around $600,000. Plans for the building include a hotel-style lobby, rooftop garden and sky deck with a communal garden. It will also feature day beds and barbecue area with 360-degree views, executive lounge and gymnasium on level 27 with sweeping ocean aspects and a resort-style pool, spa and sauna exclusively for residents’ use. Ho Bee Tower Rhapsody, artist impression of the building’s gym. The leaf-shaped building will contain a ground-floor precinct with retail, cafe and restaurant tenancies. Apartments will have a high-spec fitout and are approved by the Foreign Investment Review Board. Ms Provost said the launch of the project and impending completion of the nearby light rail station would significantly elevate the area. “It will be an appealing residential option for those seeking a beachfront address central to Surfers Paradise, Main Beach and Southport,” she said. Ho Bee Tower Rhapsody. Artist impression of the rooftop garden. Ms Provost said the unveiling of Rhapsody Surfers North followed a protracted lull of new apartment projects in an area once renowned for its high-rise activity. “Rhapsody will be the first high-rise in the area since construction of the Hilton towers started in 2009,” she said. “Most new apartments that were left in the wake of the GFC have now been absorbed and there is almost no new entry level stock in the market. The unveiling of Rhapsody Surfers North follows the announcement that the developer has appointed global construction and engineering giants Brookfield Multiplex. © 2018 DP Project Marketing. All rights reserved.